James Harvey – Many Species. 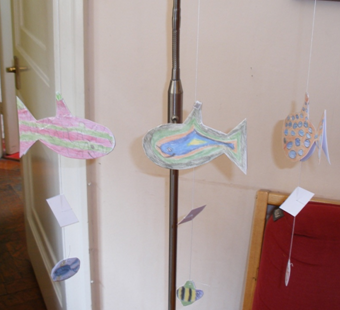 Hanging mobile with pictures of birds, bees and fishes and accompanying poem. This object is no longer available. This object has an adjunct. James Harvey (1966–2012) studied biology at UCL before becoming a full-time poet in the thriving experimental and innovative poetry community in London. James was a regular at Writers Forum Workshop and many of his poems have a strong visual element, showing Cobbing’s influence. Part of his poem ‘Living Rock Ode’ (in Freaklung 2010) included a diagram of a marine plankton that he sounded when reading the poem. James read in honour of Jennifer Pike-Cobbing in 2010 with his work featuring in AND13 (Writers Forum 2010) produced to mark the event. Later he was part of Writers Forum Workshop (New Series), his work appearing in its first publication (Writers Forearm 2011). Veer published a chapbook Temporary Structures in 2009 and included his work in Veer Off (2008) and Veer About (2011) in addition to Veer Away. He was published in the Openned magazine (2006) and Openned Issues 2006-07 (2008). In 2009, Openned brought out an e-pamphlet, Parts Composers, and Kater Murr’s press published a broadsheet From Marx’s Capital. James was featured in the anthology In the Company of Poets (Hearing Eye 2003). James’s readings in London included the Blue Bus in 2008 with Nina Zivancevic and Vahni Capildeo and in 2010 with Harriet Tarlo, David Miller and Ken White. He read at Crossing the Line in 2009 with James Wilkes, Jon Clay, Antony John and Out to Lunch. James was also part of a group of poets who travelled to Newcastle upon Tyne to celebrate Barry MacSweeney in a reading at Morden Tower in 2010. James read from his Japheth series, written in collaboration with Edinburgh-based poet Jow Lindsay. Other work appeared in Herbarium (2011), also with an associated reading, or were published online in Greatworks and Jacket, with work also appearing in Brittle Star magazine, Poetry Salzburg Review and the Morning Star.